DEL MAR, California — Del Mar’s Dog beach was the site Sunday of the largest canine surf contest of its kind, Surf Dog Surf-A-Thon 2014, benefitting people and the rescued orphan pets of Helen Woodward Animal Center in southern California. More than 80 dogs competed in four separate weight classes. In its ninth consecutive year, the event involved heats of surfing small, medium, large and X-Large dogs throughout the day. Halfway through the event, some of the dogs and their owners paddle-boarded out in front of an enthusiastic crowd for the Paddle Paws Parade. Among the pooches and people there were those who chose to add a little flair, like one woman who dressed up as a pirate and a dog dressed up as a jaws. Best in Surf Awards went to Dozer in first place, Louie in second and Abbiegirl in third. More information and winners of events can be seen on the event Facebook page. The center’s namesake and founder Helen Whittier Woodward was dedicated to helping people and animals, and it was this desire that spurred her to partner with others and founding the Center. In addition to adopting out orphaned animals, the center runs a program using horses in therapy for disabled children. 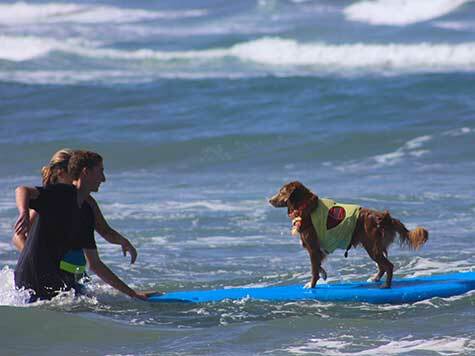 More photos of the event can be seen on the Surf Dog Surf-A-Thon UStream. Blue Buffalo pet food company was also a sponsor of the event.